Can you believe it is November! It seems like just yesterday when school was starting and summer was ending! Now we are looking at just three weeks until Thanksgiving and then just four weeks more to Christmas! Time is really speeding along. I know you stay busy putting out fires and hopefully getting into the schools to see all the great things your teachers are doing. I was just in Oklahoma at the fall conference for the Oklahoma Directors of Special Services — yes, their acronym is ODSS — which they will tell you is perfect for special services directors! While there I told them as I tell every group of Special Education Administrators, everyone who supervises special education teachers needs to be a member of CEC if for no other reason because of the amazing resources available for their teachers. I know when I was assistant superintendent of a district of 27,000 students, I was always pointing my teachers to CEC resources and that was before the Tool of the Week, webinars, and new teacher mentoring programs were available! I think the CEC publication, Teaching Exceptional Children, is by far the most important publication our teachers could have in making a difference in our classrooms and to services for children. If you aren't a member, you need to be! And if you have some PD money left, you might want to consider the District membership as it includes among other great benefits, a premier membership for you and five (5) basic memberships for your teachers, a total of 5 free webinars, and 2 registrations for the CEC convention! Of course, you should be a member of CEC so you can join CASE but I do think it is a huge resource for you as you support your teachers — sometimes we forget about that reason to be a CEC member! Speaking of being a member of CASE... Again, last week when I was talking to the ODSS members, I was reminded of all the reasons I first joined CASE in 1984 and have remained a member ever since. I could not have been as successful as I was had I not had all the support and wisdom from my fellow GCASE members and the resources from CASE at the national and international level. I remember my husband one time questioning how our superintendent felt about me being out of the district so much for GCASE and CASE meetings. I told him by being so involved, I typically knew 6 months to a year before some big change occurred so our district could stay out in front of the "eight ball!" I was always fortunate to be able to work for forward thinking leaders who knew preventive measures always saved money! Can you and your district afford to not be members? Your state and provincial unit offers you the support for what is happening in your district/state or province and CASE can assist you with the bigger picture issues! But of course, you cannot join CASE if you aren't a member of CEC! Speaking of information... It has come to my attention that some of our readers, specifically those with a gmail account, may have part of the visibility of this update cut off. If you experience a problem with the viewing of the article, remember in the upper left hand side, there are 3 buttons — the middle button can be clicked on to have the update viewed on the web. Let me know if you have any issues with the reading of the update and viewing it in the web version doesn't solve your dilemma! Sometimes technology is REALLY slower than we like... Our online shopping cart is still down for revision but we do now have the order form on the homepage where you can download it as often as you would like. I am again providing the order form so if you are wanting to order any of our practical resources right now you can! If you have any problems or just need to ask a question, then contact me ASAP! Now that it is November, it is time to really start gearing up for our 2017 CASE Hybrid. 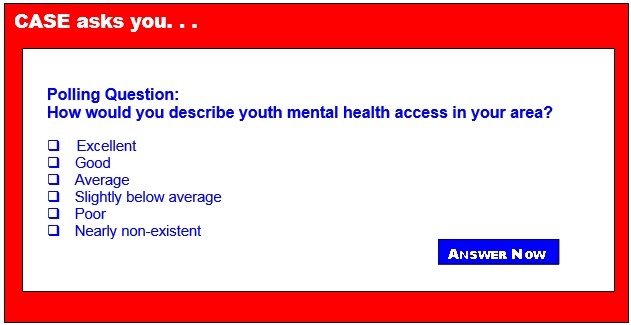 Last week we asked the question what were the biggest mental health issues in your district. You see the results below but the bottom line was you have some real concerns in your district! As I have said before, our professional development committee has asked numerous groups including our members and Board of Directors and the issue of Mental Health in our schools seems to be one of THE hot topics! What an amazing opportunity to have some of the nation's lead practitioners do a full day on mental health in our schools and community. We will start Thursday off with Dr Dipesh Navsaria, a pediatrician, occasional children's librarian, public health professional and child health advocate. A dynamic speaker who easily translates basic science and clinical medicine for a wide variety of audiences in order to shape programs and policy, Dr Navsaria lectures locally, regionally and nationally on early literacy, early brain and child development, child health advocacy and technology. He will be using all of these areas to outline the issues of mental health in our schools. He does an amazing job of blending the scientific with the practical and providing the how to steps in making our world a better place for children! This will surely be a day you will want to pull in your general education teachers, administrators, school psychologists, special education staff, community and parents together so you can take the information and personalize it to your area/schools! And the Hybrid is just the format — one price and you can have as many as you would like in the room. What a great time to have everyone hear the same thing and then apply to your students and families! The second day will be the legal implications of some of the mental health issues as well as a general legal update. So, you need to start getting the logistics lined up for Feb. 23-24. All you need is a big enough room, internet, LCD projector, sound and screen! We don't even mind if you want to charge a registration fee to either cover the cost of snacks/lunch or make money for a school project! We even have HINTS for you to use as you set up your virtual site! OR... you could come to be with us at the point of origin, Clearwater Beach, Florida. Just think about what it will be like the week of Feb. 20 where you live and what it will be like on the warm, white sands of Clearwater Beach, Florida! If you ever attended the CASE Winter Policy Institutes, you might remember the lovely Sheraton Sand Key Resort! Though, the hybrid isn't run the same way, this is still a great location for any meeting in February no matter where you live! The room link is already live so go ahead, start planning that winter get away! This conference format is perfect for maximizing your professional learning dollars since the registration for sites is the same as just one registration! Save the dates now — Feb. 23-24! Last week's poll asked which mental health issue seems to be the highest priority for your district/school? The number one answer at 71 percent was behavior crisis. In a distant second place with 14 percent was self-harm. There was a tie at 7 percent anxiety and depression. I was surprised Bullying didn't even get a vote but maybe all the work our schools have been doing the last few years has paid off with big dividends! All three of these mental health issues have various causation's and impact on all of our students and their ability to achieve. I believe you will learn a great deal from both Dr. Navsaria and Dr. VanAcker on what we as the school community can do to assist our students at our 6th Annual CASE Hybrid Conference. Registration should be up soon — watch for it! Restitution is a philosophical framework that provides a different way of looking at crime and criminal justice. It was first used in the criminal justice system to allow people to financially repair the harm they caused. In schools, traditional discipline systems are not very effective in teaching how to resolve conflicts, nor do they teach students how to repair the harm they have caused to relationships. Using this model within schools might be a useful alternative to traditional exclusionary discipline consequences because it can offer a better chance to bring about behavior change and "healing." Preliminary research shows promising outcomes with this approach, resulting in less frequent and severe disciplinary incidents. Video | How do live, online psychoeducational assessments work? The Office for Civil Rights is pleased to report several new resources related to the 2013-2014 Civil Rights Data Collection. We hope you find the resources useful in your work. The CRDC is a powerful tool that not only enhances OCR's enforcement work, but also informs student, parent, and educator decisions, and helps researchers, advocates and the public to identify and shine a light on systemic concerns. First, you can access the 2013-2014 school year data on the revamped CRDC Reporting Website. The Reporting Website contains summaries of selected facts, detailed data tables, data analysis tools and special reports for the 16,758 school districts and 95,507 schools that completed the 2013-2014 CRDC. The special reports that are available are focused on discipline, English learners, and educational equity. The data analysis tools allow a user to generate comparison graphs and outcome rate calculations. Second, using the CRDC, OCR compiled for the first time the names and contact information for the civil rights coordinators (Title IX coordinators, 504/Title II disability coordinators and Title VI coordinators) of virtually every school district in the country. That contact information can be accessed through the Reporting Website above (through the district characteristics page) or at a separate OCR Civil Rights Coordinators Website. Purchase a Learning Ally membership for your school or district by November 15th and receive 10% off, plus FREE passes to our online conference, Spotlight on Dyslexia. Contact our Education Specialists today at 800-221-1098 or programs@learningally.org, or fill out our online form to learn more. The Education Department released non-regulatory guidance on supporting early learning through the Every Student Succeeds Act to help ensure young children from birth through third-grade get the strong start they need to achieve success in school and in life. MHS has been a leading publisher of scientifically validated assessments for over 30 years. We are proud of the high quality our assessments stand for. Do your schools have more gifted students than you thought? Summary: To implement the changes to the Rehabilitation Act of 1973 (Act) made by the Workforce Innovation and Opportunity Act (WIOA), the Secretary amends the regulations governing the State Vocational Rehabilitation Services program (VR program) (34 CFR part 361) and State Supported Employment Services program (Supported Employment program) (34 CFR part 363). In addition, the Secretary updates and clarifies prior regulations to improve the operation of the program. Finally, the Secretary promulgates regulations in new 34 CFR part 397 that implement the limitations on the payment of subminimum wages to individuals with disabilities in section 511 of the Act that fall under the purview of the Secretary.